The John McDouall Stuart statue in Alice Springs continues to evoke a deep emotional response from townspeople, say two Charles Darwin University researchers in the Red Centre. 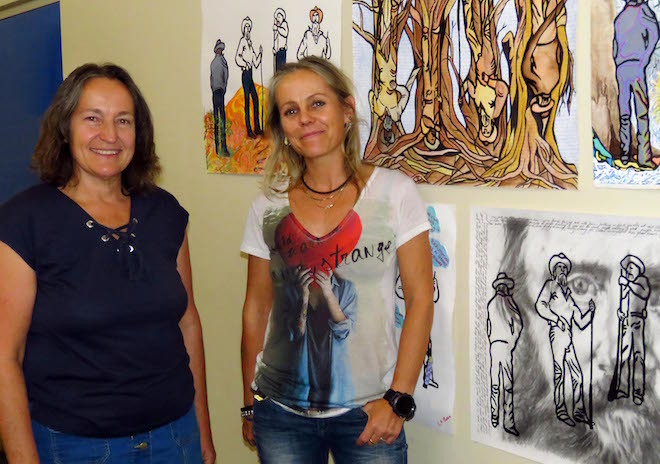 Senior research fellow and former creative arts therapist Dr Judy Lovell said a public arts engagement project that centred on a statue of the explorer had tapped into a vein of powerful emotion and resulted in the production of a collection of thought-provoking artworks. “Participants have expressed hurt, anger and sadness among a broad range of visual responses that also was marked by humour, quirkiness and an appreciation of arid landscape,” Dr Lovell said. Dr Lovell said that early this year more than 20 artists, writers, and educators from different cultural backgrounds were invited to respond artistically to the 4m high statue, which has been situated in a public park in Alice Springs for the past four years. Each contributor was given a print containing an outline of the statue from four angles. “The responses have been inspiring,” Dr Lovell said. The statue, made by Territory sculptor Mark Egan, has been the subject of controversy since it was gifted by the Freemasons to the town in 2010, marking the 150th anniversary of Stuart’s first journey into Central Australia. Dr Lovell said the project was partly inspired by public engagement art initiatives in cities around the world. Dr Lovell and Senior Lecturer in Education Dr Al Strangeways will present an analysis of their research to the Law, Literature and Humanities Association of Australia conference in Melbourne on Thursday. “Our paper, Monumental in a small-town way”, explores different people’s responses to the statue, the man and the colonial era,” Dr Lovell said. Source: Charles Darwin University media release. Long live Stuart the Explorer and Two-Up the Bunny! Long may they stand with the Undoolya Perenti as monuments to Alice Springs’ artistic identity. More would be better. Where is the Indigenous hero to join Stuart along Stuart Terrace? We all know Council would fall over themselves to balance the story being told there. Mark Egan has created a couple of outstanding examples up the track at Aileron, but whether he would again willingly venture into the hotbed of PC naval gazing that seems to be the default atmosphere here is another question. We don’t really care how artists express themselves – dot painting, watercolour landscapes, Statues of explorers or funny yellow bunnies. It is important to be respectful of how others see things, either via artwork, politics or religion. What we don’t need is an arts therapist telling us what to think about any type of artwork – like politics and religion, that is a personal matter. Perhaps the explorer and the bunny could be reproduced as mini souvenirs? They might prove popular with tourists. Went to Budapest in 2003, home of the indigenous Magyar people. A unique tribe of ancient warriors not related to the Slavic peoples of Europe that surround Hungary. On every street corner, in public parks are statues of ancient warriors on horses. And outside the athletics stadium in Pest are the statues erected by the Soviet Russians. Commemorating the proletariat of Communist oppression. Knocked down, broken and lying in the long grass where the pigeons poo on them. Left there deliberately by the descendants of the Magyars who drove the Russian Communists out in recent times. Left there as a reminder of the oppression. Perhaps some of our chattering activist class in academia who are hot and bothered about an explorer of Central Oz might like to rock on over to Budapest establish a sister town link – to get an idea of what constitutes real outrage over real oppression. May I ask if those artists looked at the statue with the 21st century eye or from one of 1870s era? The gun? Not so long ago any one working in the outback carried one in his/her vehicle. @ Fred the Philistine: What environmentalists have to do with the statue? I am what you call a “tree huger” and I like Stuart’s statue. @ Ted Egan: Well said. What amazes me is 20 to 30 people sleep around the statue of Stuart, which means they must feel safe. We need more statues like this especially of the Afghanastan history in the area. I have been out to Aileron and seen the statues out there and they are magnificent. Your son has done an excellent job. If it was not for the statues there, I would not have stopped, this brings tourism. I know the man is holding a spear but I am not offended by it. The problem is we have too many tree huggers. I am not sure if the headline is really accurate, especially if the word town is used as a collective. I think the statue was a wonderful gift to our town, and due to the nature of the subject matter, naturally it will put some people off, but not the collective “town”. As far as I can comprehend, there were more than 20 artists, writers and educators were involved. Did they survey a town of 27,000 people? I really think that with a sculptor with the talents of Mr Egan, we could display a sculpture of a famous Centralian on every roundabout around town, like the Perrrente on Undoolya Road. These could include Albert Namatjira, Noel Fullerton, Ms Olive Pink, and many other important figures, both black and white, who contributed to The Centre in some way. Plaques could be mounted on the footpath describing who each person was. A walking map could be produced guiding people to each one with a description. Would brighten the town and allow us to honour those that made this region what is is today. As the father of the sculptor I am biased, but I hope that the people who object to the Stuart statue are consistent and demand the removal of all the Lest We Forget statues throughout Australia, where the figure portrayed also has a firearm. My son’s other statues at Aileron depict a First Australian man with a weapon, also a First Australian woman who has just killed a goanna. How dare people carry weapons in order to live off the land? I’ll have to speak to my son, but I guess he has inherited suspect genes. Stuart’s track record as he explored Australia was exemplary. Never has one statue in the history of Alice Springs created so much verbal effluence. I’ve not come across the term “creative arts therapist” before, but as a writer, it suggests that artists and in this case, the sculptor need therapy in order to heal, not just ourselves, but the culture within which we live. I’ve heard of cultural amnesia, but not cultural healing, although, perhaps, this is what the Reconciliation movement has been attempting and, I guess, those in the aftermath of war, once the dust clears and what’s left is assayed. This seems to be a definition of what is meant here. Ironically, an “appreciation of arid landscape” noted by the analysts, came about because of the Stuart Highway and without the statue which has the “town upset”, this exhibition may not have happened. In this paradox, difference is celebrated, but given that all difference is equal, some people don’t appear to mind. Perhaps, they have cultural amnesia or some other malaise.